An effective work station allows for a worker to easily utilize, access, and organize the items necessary for the completion of his or her activities. Work stations are typically used in many industries to help increase overall productivity by eliminating unnecessary movement or actions. Work stations are used by clean room workers, factory workers, assembly line workers, operators, office workers, air traffic controllers, and call center staff. Custom work stations such as industrial work stations, work benches, computer work stations, and command operation centers are used in almost every business and industry. It is important that work stations be ergonomic for the health and comfort of the worker. Ergonomic workstations are made to accommodate workers and to adapt to the workers’ movements and job tasks. 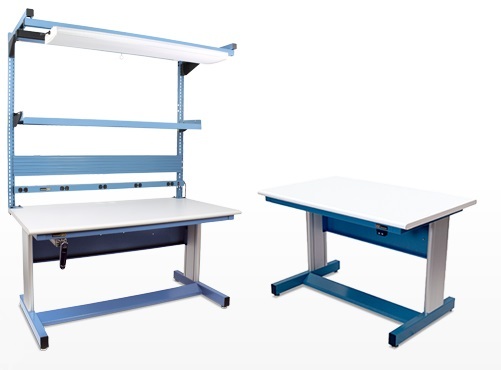 These work stations should be adjustable and modular so that they can be raised or lowered, or so that drawers, chairs, and cabinets can be moved in order to suit specific needs of workers. Work stations are widely used because of their ability to prevent injuries, reduce stress from repetitious activities, and as a result increase overall productivity. While work stations are important in factory, manufacturing, and office settings because they cut down on worker stress and help to eliminate injuries, they are also utilized in various clean room and research industries as well. In addition, while industrial equipment manufacturers often refer to “works tations” and “work benches” interchangeably, there is a small difference between the two terms. “Work stations,” in industrial manufacturing, encompasses assembly tables, chairs, storage benches, racks, laminar flow benches, cleanroom work benches, and office tables, and although “work bench” often refers to the same items, it more specifically refers to assembly tables, storage tables, and lab work tables, focusing on work surface areas instead of entire units with furniture, shelving, and storage. Additionally, work stations are sometimes used to refer to non-industrial computer systems or office furniture sets. This is the difference between “work stations” and “industrial work stations” (which refers specifically to the types of workstations used in an industrial setting) in the broader commercial and manufacturing community generally refer to either a) office, IT, home or school workplace furniture, and computer work stations, CPU holders, and furniture or b) computers and computer systems which provide a software “work station” for IT administrators. Work Stations Work stations create efficient spaces in which people can perform their specific tasks. Work stations are used in order to create a safe environment for the worker and to create an efficient place to carry out job duties.